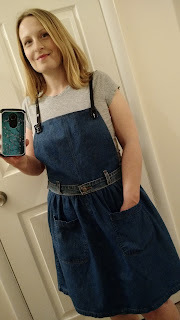 For a while now, I've wanted an overall dress, sort of like this one. 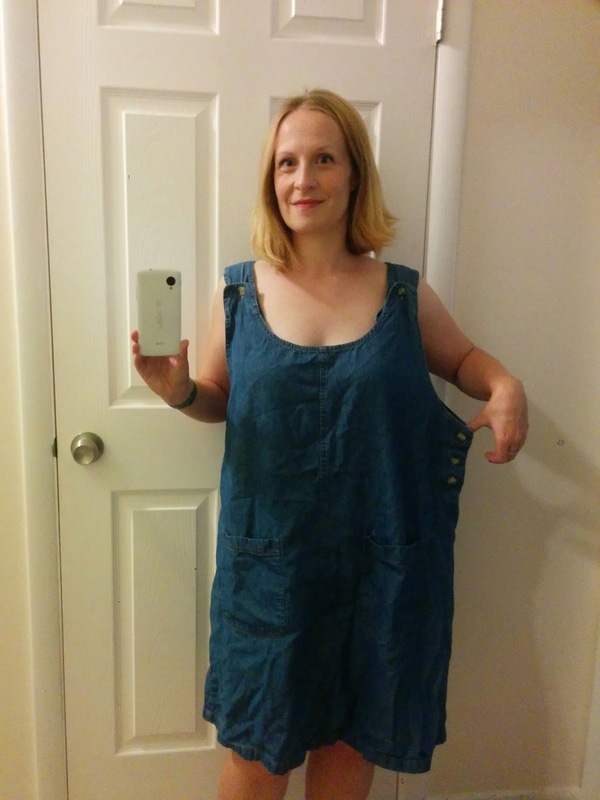 When I saw this huge, lightweight denim dress, I knew it was the perfect based for such a dress. 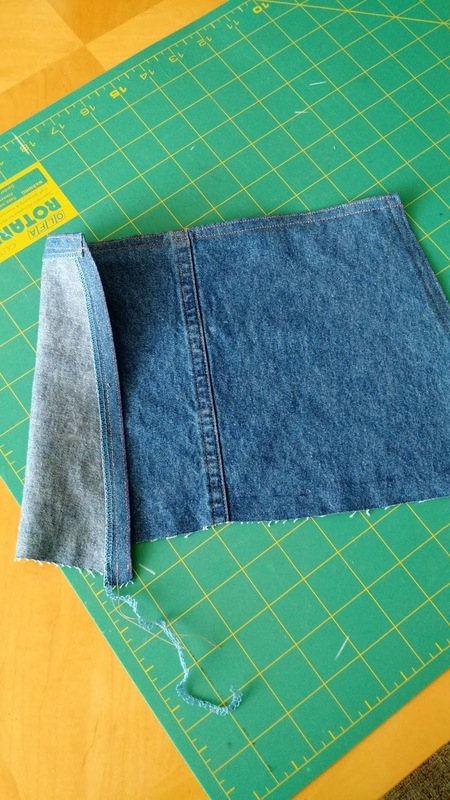 I started by chopping it in half so that the bottom part was the right length to be the skirt. I decided to gather the skirt, since that's more flattering on me. 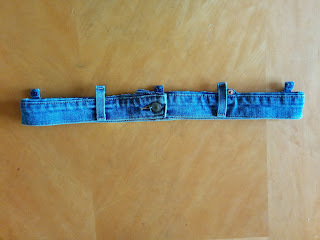 I also thought a waistband would look good, so I removed this one from an old pair of too-big jeans. I used the top part of the dress to fashion the front and back panels of the overalls. 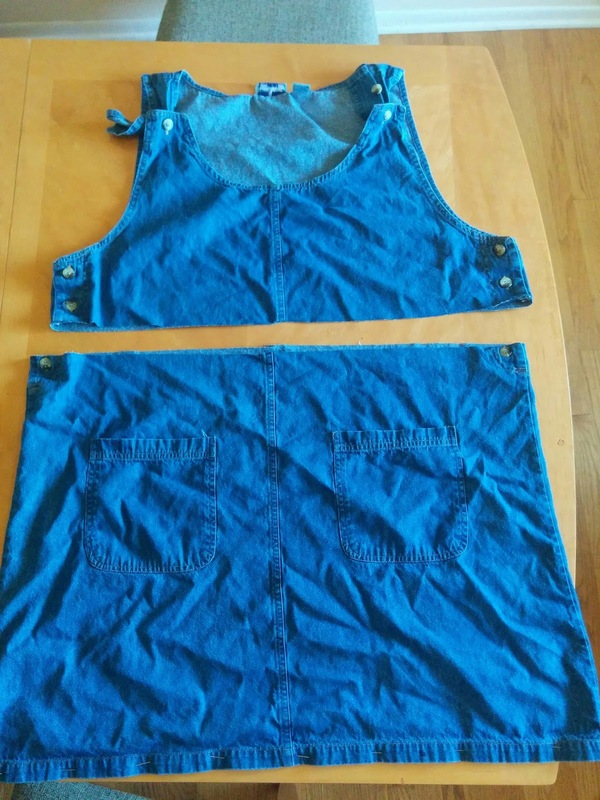 It was a bit challenging to get my stitching to match the existing stitching, but it was worth it. 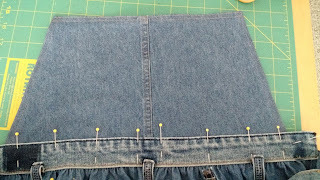 I cut the waistband into a front piece and a back piece, then started to put the pieces together, like so. I wanted to look of the patent leather straps, but not the risk of them being destroyed in the dryer, so I opted for removable straps. I took two belts I bought for $1 each from the thrift shop, cut them to size, and glued big snaps onto the undersides of both ends. 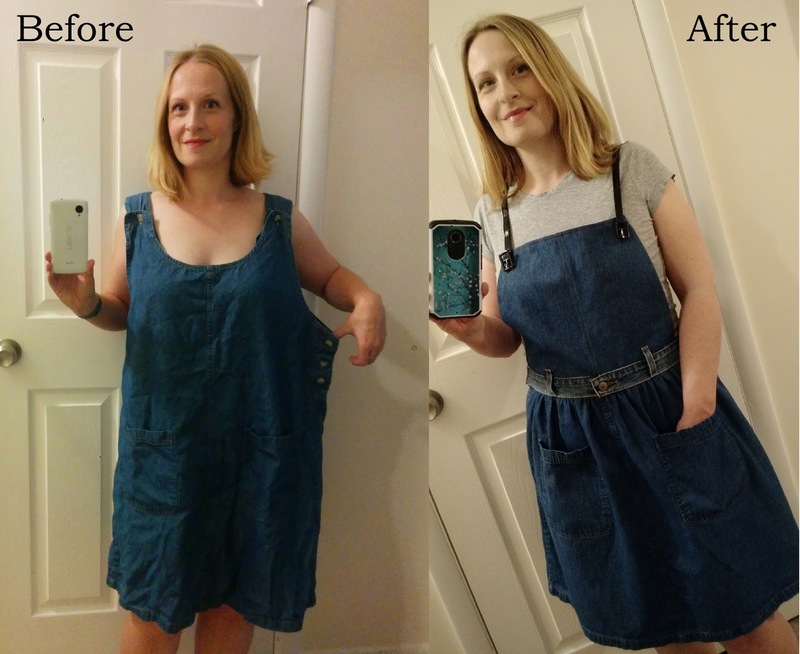 After hand-sewing the other halves of the snaps onto the dress, and a few small snaps at the waistband, my new overall dress was ready to go. I started this refashion way back in November, when it wasn't so cold, but I hope to get some good use out of it when it warms up again. Or I may just wear it with fleece leggings and a sweater! That is super cute! 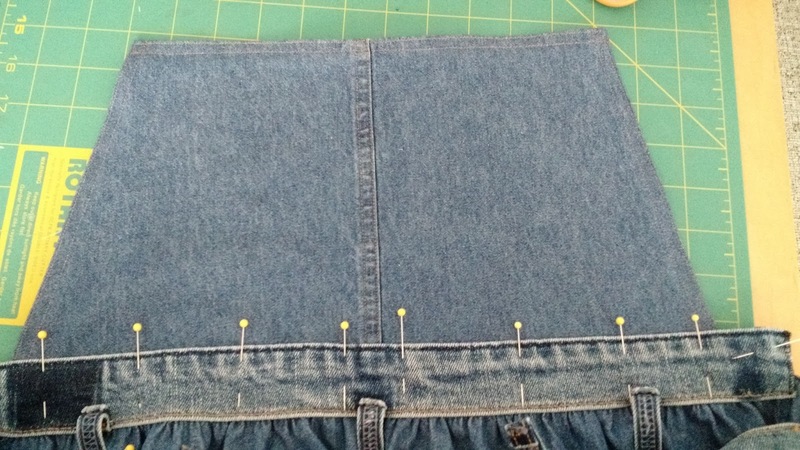 Lining up existing seams is always a pain in the tush but I agree that the effort is worth the pain in the end. 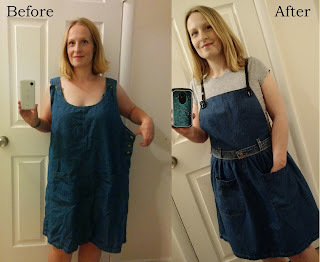 :) Great refashion. Amazing attention to detail! I love the straps. I love this type of dress. I have one that I wear whenever I need pockets! 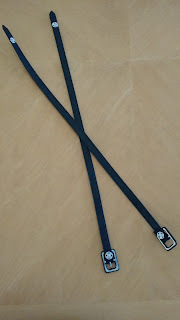 Your idea for the straps is very clever, not to mention easier than making straps. 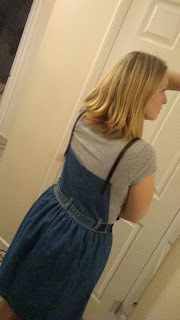 Then you reused the waistband from old jeans - impressive resourcefulness!